As the 2007 edition of Momentum (Brethren National Youth Conference) gears up, young people and adults from around the country are preparing to spend a week being challenged in the Word and sharing their faith through serving others. Here’s a story from Aiken Today about a group of teens and adults (pictured at right) from the Grace Brethren Church in that South Carolina community who are getting ready to attend Momentum. A group of teenagers from Grace Brethren Church are headed to the gulf on a mission to help rebuild some of what Hurricane Katrina destroyed. 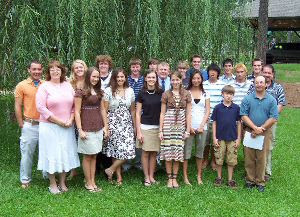 Youth Pastor Donald Soule is taking 20 teens and four adults to Gulfport, Miss. to attend a youth conference “Momentum.” As part of this conference, they will have a chance to cleanup and do construction work in the area. The group will leave this Saturday and return in Friday, July 27 and will be staying at the University Southern Mississippi in Hattiesburg. Each day the conference will take a group of 300 out to work at the sites for about six hours. The groups going to Gulfport will be finishing up jobs by doing the painting, yard work, sheet rock and things like that, Soule added.